I’m a scruffy semi-bearded man who takes photographs of everyday things, usually wearing boots, baffling t-shirts and a hat. I often get puzzled looks from people: “Why is that man taking a photo of a wall?”. I don’t mind. 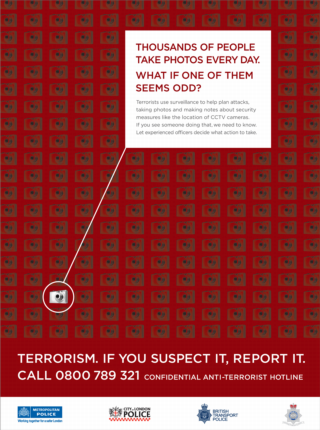 I expect to be reported as a terrorist at some point if this stupid campaign spreads from London to Manchester: “That man is taking pictures of a bus shelter! Call the police!” That’s something I do mind. Update: Austin Mitchell MP (a keen photographer himself) is going to raise this issue with the Home Office. More at BoingBoing.net. It’s probably worth sending a letter or email to your local MP.